On the go or just feeling lazy on your couch? Just saying “Check Email” will check for new messages and give you a list all of your recent emails. If you feel like responding to one, say “Reply to (Name)”, then provide a response to Siri for the message. You can also compose new emails by just saying “Send email to (name) saying (message)”. Wondering when kickoff is? Maybe you’re on the road and want to know the score of a game? Siri knows, just ask. For the best results with sports, you’ll want to be fairly specific with team names, since there is some crossover between different sports. It’s best to ask something like “When are the San Francisco Giants playing” rather than “When are the Giants playing”, since you could end up getting results for New Yorks football team rather than the baseball info you actually want. Either way, Siri works great for this. Siri will type out text messages for you, which is wonderful if you either don’t like typing on touch screens or you’re driving and can’t send texts anyway. Just say “Send text to (name) saying (message content)” and it will be done, it’s really that easy. Just like it’s often easier to talk out a text message or email while you’re driving or your hands are busy, so is making a phone call. A quick “Call Mom” is all it takes, and you’re on your way. You can also identify relationships to Siri by assigning contacts to relationships, like wife, girlfriend, dad, mom, brother, cousin, etc. 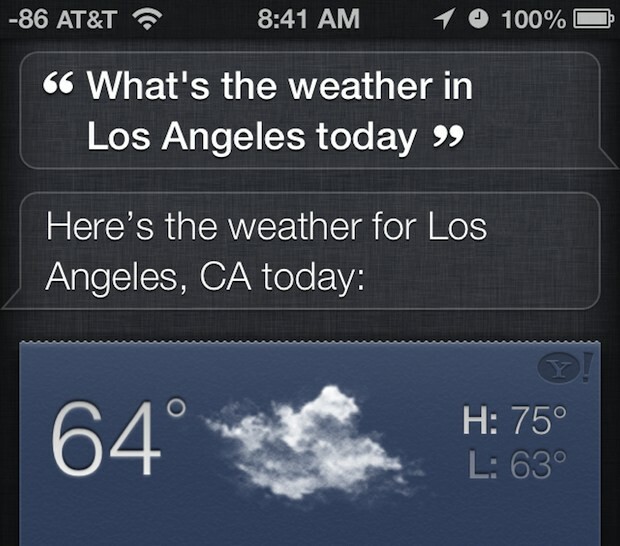 Whether you want to know the local weather or the weather at a destination, Siri can do it. Asking “What’s the weather” will give you the current locations weather and temperature, and specifying a location will tell you what the forecast is for elsewhere. Much faster than tapping around to launch a weather app! Want to take a two hour nap? 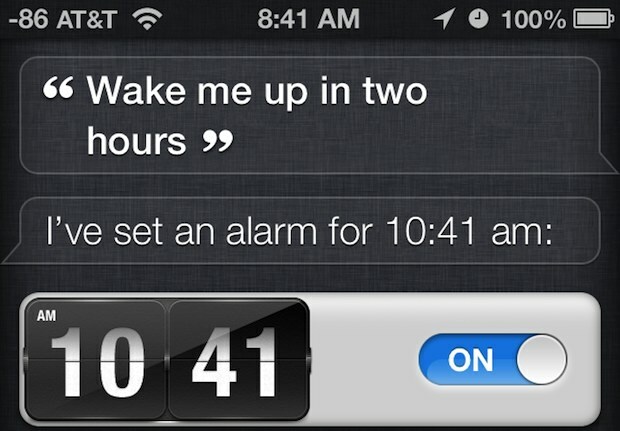 No problem, just tell Siri to wake you up in two hours, and an alarm will be set for you. Of course, you can set normal alarms through Siri by saying “set an alarm for this time”, but the nap approach is very useful. Wondering when a movie is playing nearby? Siri uses your location to find out. Just ask “When are showtimes for (movie name)” and you’ll get a list of all times for that movie playing at all nearby theaters. This is much quicker than launching an app and searching around. 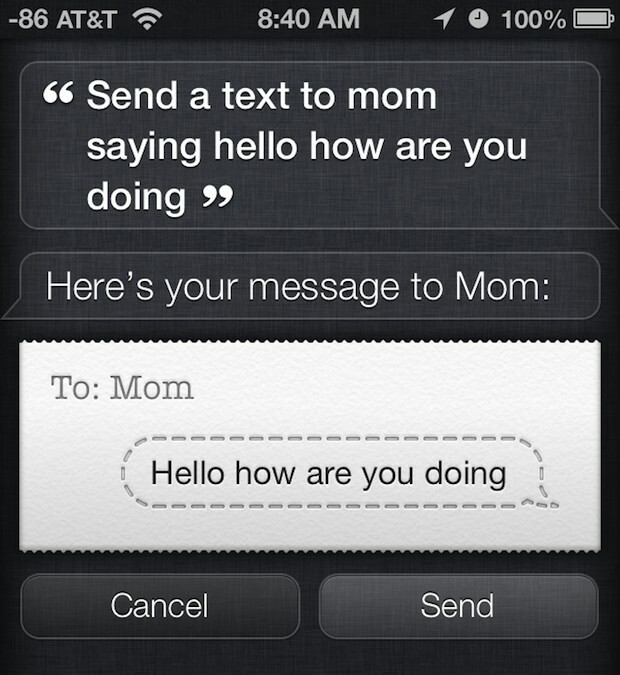 Do you use Siri for anything in particular? Let us know in the comments. I use Siri almost exclusively while driving or sitting on the couch, it’s great as long as your have a good 3G/LTE connection. Best Siri tip I discovered is with the Apple headphones plugged into an iPhone or iPad you can hold the MIDDLE flat button to talk to Siri! You can do that anyway without earbuds. Hello! I never though I’d use Siri but I’ve been using the new sports features a lot. Check standings, game times, scores, players, great way to keep on top of things. 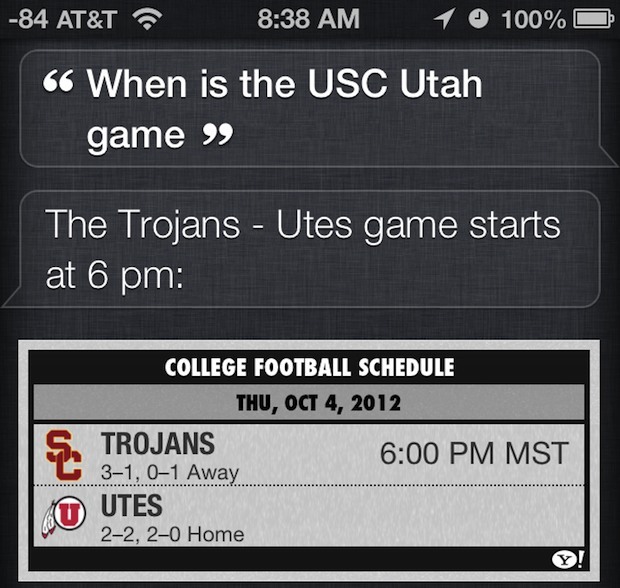 I just now asked Siri when the 2012 Alamo Bowl is, and got an answer. I then told Siri to add that game to my calendar. It started a calendar event titled “that game” and I had to abort. So then I said specifically to add the 2012 Alamo Bowl to my calendar, but the reply was “What time is your appointment?” Failure. You can say ‘change title’ to alter an appointment title that Siri hasn’t got quite right. I find myself using Siri constantly. Most of it is exactly what others are saying, but I’ll do it to remind me to take clothes out of the washer and dryer, to set meetings, reminders, check sports scores, standings, schedules, stats, movie times, movie reviews, send texts, etc. etc. It’s amazing how handy it is while it still has a limited feature set. What will Siri or similar software be like in 5 years? or 10? I think the kids of today are going to grow up in a world where keyboards are the odd, old device that is rarely used. I’ve found some tricks by accident. Figuring out tips and taxes is one example. One day, I asked Siri to create a meeting with one of my contacts and it added him as an attendee by default – I did not expect that. Obviously, in order for this to work you’ll need to have an email address for that person you want to add to your meeting. I like the part where you can ask Siri to assign relationships with other contacts for later use – like “call my wife”, “tell my sister”, etc. I find myself using Siri quite a bit. Mostly for reminders though. As with anything Apple – support here in South Africa is limited with Siri! I use Siri more than I did with IOS5 primarily to launch apps, though the sports features are great for checking on my Big 10 teams. Still love seeing what flights are overhead with Siri. I have persevered with Siri – correcting what it’s heard to improve accuracy. I find it really useful for emails, texts and Reminders. I am working now on using the geo-location part of Reminders. Persevering with it is key to improving its usefulness. Try putting Walmart’s address in your contacts. It works for me for Vons. I’m quite proud I got “remind me to say happy birthday when I get to my mother-in-law’s house” to work! Alarms are fairly powerful. I use “show alarms”, “turn all alarms on/off” and “set an alarm for (time)” to change mine. Much faster than messing around in the settings twice a day. I like Siri’s integration with Music as it saves tapping around to play tracks from my music library. “Play some Sinatra” gets me a random Frank Sinatra track, or “Play I can’t get behind that” gets me a specific track (from Shatner’s “Has Been” if you’re interested). I discovered that I don’t have to tell Siri “Open” or “Launch”. All you have to say is the exact name of the app. For example, “Flashlight” will open the Flashlight app. But if your request is ambiguous, for example, “Angry Birds”, then Siri will ask you which one you want her to open. ‘Set four minute timer’ is much easier for timing my coffee brew in a morning than having to set it manually. Conversions are handy too ‘Convert gas mark 4 to centigrade’. ‘What date is next Friday’, ‘What day is 18th of August’, there’s all sorts of simple things you can ask. 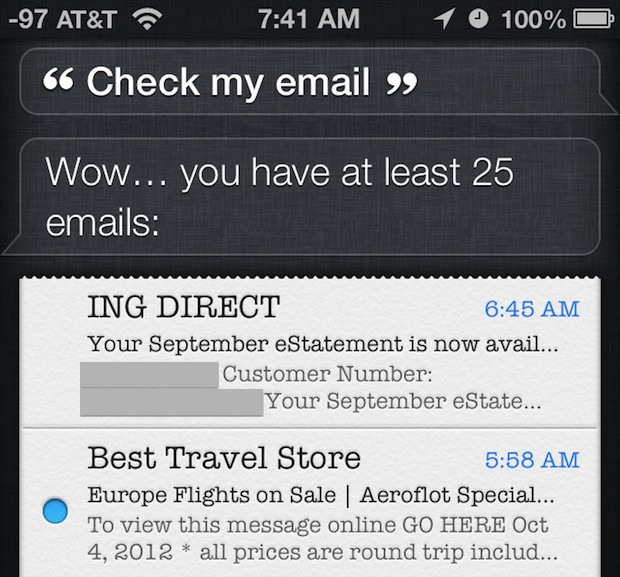 Launch Siri and tap the ‘i’ next to the title bar and have a browse; there are all sorts of neat tips in there. Each type has an arrow on the end you can tap to see all the different options within. Use Siri for sports score, find out where the A’s are in the standings. Use Siri for weather (current and forecast), converting ounces to pounds, writing out posts on forums or emails, when Costco is closing, how to get to Greenlake Park (it will automatically use Maps). My kids asked her “what does the fox say?” And she actually answers correctly. It’s pretty funny. I’ve found Siri to be about worthless for anything except the weather and ready messages. When using it to compose a message it doesn’t get it to where anyone would understand it. After configuring my stocks in the app, I asked; “Hey Siri, how are my stocks doing?” Outstanding!